Disclaimer: I’m a total city girl. I’ve never been camping, I’m 5’2”, and my goal was to visit Patagonia before I turned 40 (accomplished, but just barely!). I work out often, but I’m not an athlete. My weekly workouts pre-Patagonia was mostly yoga, pilates. and the occasional jogging and interval running on a treadmill (I’m slow, I generally run between 5.5 mph and 6.0 and sprint between 7.0 and 8.0 mph). Once I signed on for this trip though, I definitely changed up my workout routine. For the average person with a desk job, no, you can’t show just show up and do the hike, especially if you’re carrying weight on your back. You could, but I think you’d regret it. Some parts of the trail are steep and requires a bit of leg strength and arm strength if you’re a shorter person like me who needs to pull herself up with trekking poles! If you’re not in a rush and you’re not in great shape, you can still do the hike. You just will have to take it slower. For my trip, I was on a tour group and most people in my group were seasoned hikers/outdoorsy people or taller (there was one guy who was 6’5”—for every step he took I probably took 10 steps!) so I felt the urge to keep up but no one rushed me. For me, about 2-3 months before the trip, I started to increase my cardio/endurance workouts. This included taking HIIT Barry Bootcamp classes, running more, and increasing my strength with squats. I also tried to go hiking once every weekend and carried around a 20-25 lb. backpack whenever I went hiking or did stair climbing in my 18-floor apartment building. For stair climbing, I tried to do this at least 3x a week, walking up and down my building about 4x (this equated to about a mile). This took me about 40-45 minutes if my backpack was heavy; it takes me about 30 minutes without no backpack. The first time I climbed my apartment building up and down I only did it twice and my entire legs (thighs and calves) were sore for 5 days! It took me about a couple of weeks to no longer be sore in my legs. And since I’ve been home I’ve continued the workout as I think it’s great, easy and an efficient way to exercise without having to go to a gym. I didn’t really lose any weight (I unfortunately love to eat) but I did find my body shape more toned and changed in that regard. Living in NYC I love to walk everywhere and I would aim to walk at least 8-10 miles one day a weekend as well. In general, I think it’s important to be in decent shape to tackle this trek as the hikes are long. I never found any hikes in the U.S. when I was hiking that were as long as the ones we did in Torres del Paine as I just didn’t have the time to hike 8-9 hours in one day. The longest hike I did before this trip was about 7-8 miles in Los Angeles and a 7 mile one in upstate NY. I even hiked once in the rain (which sucked) but I wanted to be as prepared as possible in case we had bad weather. Carrying a heavy backpack around really helped too and I ended up carrying less than what I practiced with. I never set foot into an REI store until this past year. It is the Amazon of outdoor gear and clothing, I love it! They have everything you could possibly need and the people who work there are so friendly. And if you plan correctly, you can score big ticket items on sale (like around Labor Day Weekend). Everything I needed I bought from mainly REI. They also have an outlet with even bigger discounts. Crossing one of the many bridges in the park over that fresh blue glacial stream. Woman’s Ruckpack 40: The more I visited REI last year, the more I learned about how much all the employees love it. The main takeaway I came away with though is that REI’s own manufactured products are amazing and on par with other brand names. This woman’s ruckpack holds 40 liters and was perfect for trekking. The straps are padded and comfortable and helped distribute the weight of my bag pretty evenly. It also came with a rainproof cover and you can even zip the straps in so it kind of turns into a duffel bag. This bag was ‘heavier’ (4 lbs.) than what my friends brought but I think mine was more functional. I also love how you can unzip the bag in a shape of the way of a suitcase and all the many compartments and hidden pockets were helpful. The shape is also wider than most bags (which are more narrow and taller) so I personally liked everything about this bag. I got it in green but doesn’t look like that's available anymore! I also got it for sale, under $100 during the Labor Day weekend sale. Lock for locker: This was only helpful at one of the refugios. A small lock would do; I had one of those old school high school locker locks. Lock for my backpack: Helpful when we had to leave our backpack behind and carry just a daypack. This gave me peace of mind but I never really left anything valuable in my backpack. Quick Dry Towel: I got this microfiber towel from REI. I initially got a large, but it barely covered me and I am not a tall/big person! I switched it up to XL which was a lot better (and twice the size of L). This was helpful to have since not all the refugios give you a towel. It did stink after a while though because drying conditions weren’t great (too cold in the rooms to dry well) but it’s just for a few days that you’re using this. Face Wipes: As a girly girl, I like to feel clean and though the water in the park is pretty clean, I felt better having moisturized wet wipes for my face. Hand Wipes: Wet Ones—always great for travel, especially when there are no sinks or soaps around! Shampoo, body wash, tooth paste, mouth wash: All travel-sized and needed, since the refugios may not offer anything. Sunscreen: Primarily for the face and hands; it was not warm enough that more skin was exposed. Sunscreen is very important there! Ear plugs: There was a loud snorer in our group and this was super helpful to drown him out. Mack’s worked for me, I brought a few pairs on the trip. Cap: To keep your head warm and the sun out of your eyes (and rain!). I brought two caps—one baseball one and one wool one (made by Tilley—no longer on REI but maybe next season it’ll come out again. I got it on sale at the outlet. Looks similar to this little kid’s one). Advil/sleeping pills: I almost brought Imodium with me as well but honestly when you have to carry everything every ounce matters! So pick and choose what you think you might really need in terms of medication. Never needed the Advil but sleeping pills were helpful to lull me to sleep. Nuum Hydration Tablets: Great to help hydrate you and all the flavors were great! I would continue using this in my every day life. Available at Whole Food’s too. Band Aids and Blister Band Aids: I am SO glad I brought two different types of blister band aids as I ended up using ALL of them! I thought I would only use one but nope. Went through the pack. I really liked Second Skin, especially for this bunion I have on the side of my foot. There was another one I had that was more of a bandaid I had to cut down. Either way, bring more than you think you’ll need. Knee Brace: I don’t have terrible knees but they do get sore after walking/hiking so much. These were helpful for the trek and I noticed the difference one day when I was hiking in El Chalten and didn’t have them. Travel Adapter & Extra Battery Pack: My travel charger converter which is old didn’t work in Torres del Paine (different plugs). My friend had an extra universal one that worked though. Anker is great as an extra battery pack—lasts for days. Foneleash: I was paranoid about losing my phone to the wind or dropping it somehow so I got this foneleash to wear it on my wrist if I wanted (which I never really did). It was helpful though if I took a picture from somewhere I was afraid to drop my phone. Dry Bags: I got my dry bags (to waterproof your gear if it rains) from a Columbia outlet. They worked great but are no longer sold anywhere else. Zip-lock bags: Used for holding and organizing misc. items like wallet, passport, etc. Bring a few clean/empty ones as you may need them during the hike to hold garbage or stay organized. 21. Water bottle: I didn’t love mine (if I didn’t screw it well enough water leaked from the top) but the design was nice. I can’t remember the brand name of it but all you need is a water bottle that you’re comfortable with size-wise. The water was really clean in the park and I didn’t think a filter was necessary. Mine had a built in carbon filter but that doesn’t purify the water. I think mine was less than 1.5L big and that was fine for me. I filled up on the streams multiple times. 22. Bug spray: I didn’t end up bringing any and we didn’t need it in November (not warm enough). It was helpful in Mendoza though! 23. Sleeping bag liner: Didn’t really need one but was helpful to have. We slept in a sleeping bag once, and it seemed clean but I used the liner anyway. 24. Heat Tech clothes: Uniqlo is great. The ultra heat tech and normal heat tech wear kept me warm. In fact they were too warm to wear as layers since we had good weather! My initial intent was to wear them hiking but I ended up wearing them as pjs to sleep in. 25. Great hiking boots: Mine were from Ahnu and were waterproof and comfy (I have wide feet). They no longer sell the ones I bought two years ago at REI but I would use the Ahnu brand again. 26. Extra pair of comfy sneakers: I brought a very lightweight pair of sneaker from Skechers. You are going to want another pair of shoes to wear after hiking! 28.Fleece. I almost ditched the fleece because the fleece and rain jacket took up the most space. I ended up wearing my rain jacket most of the time as my outer layer. The fleece came in handy when we were at the top of the mountains though. 29. Rain jacket. I got mine from Northface and loved it. Kept me dry. 30. My day to day outfit was a pair of windproof Northface pants. I would wear one of my heat tech pants underneath as a layer. I also had another lightweight pair of yoga/workout pants on the days I didn’t need the windproof pants. On top I had a quick drying top, a UV protective hoodie from Uniqlo (I love these and own like so many versions), and had an extra top as well. 32. Carabiner: I did not have one and had to borrow a friend and now I would buy one! This was great for clipping my water bottle to my bag for easy access as well as the lunches if I could. Sometimes the bagged lunch came in a pouch with a string on it, which is why I could clip to the outside of my backpack. 33. Trekking Poles: You will need these! I loved these foldable/carry on size one from Black Diamond. I got the shortest length based on my height (under 110 cm) and it was great. Easy to use and adjust. Held up well. Will continue using as long as possible! 34. Swim bikini bottoms: Not used to go swimming but to wear and wash and hang dry after every hike instead of bringing undergarments. I brought two and it was comfortable to wear on hikes and easy to maintain cleaning while hiking rather than cotton or other material. 35. Compression sack: I got this right before I left cuz I needed a way to downsize all my clothes! This was helpful. 36. Misc Items: Hair ties, Apple Watch, Kleenex, Q Tips, Comb, Neosporin, socks (for hiking and for sleeping/relaxing in refugios in). The Apple Watch was great because I would set my morning alarm on it and it vibrates, not causing any sound to anyone around me. I primarily got it though to track the miles we walked and calories spent. As I mentioned in a prior post, I spent 2000 active calories on the Blue Tower hike and 1500 resting calories. I don’t think I’ve hit that high in calories on any day since then. One my favorite moments on the trek—sunny skies, pristine lakes, nothing but bliss all around. Monitor the weather forecast before you leave. As I mentioned in a prior post, this website was great for forecasting the weather. I checked every day from a week before we left and it was fairly spot on (and in fact, we had a little bit nicer weather than predicted). Just be sure to change the altitude to the lowest level. Exchange some Chilean pesos before arriving. I was able to obtain it from my U.S. bank at a decent currency rate (it’s so cheap there compared to the U.S.). You won’t need much though as most places take credit cards, but you would need it for the taxi/tipping if needed. You could probably also use Argentinian pesos but Chilean money was preferred. Research the route you’re going to take and have an idea of how long it takes to get from one point to another! Luckily we had Chile Nativo organizing all our routes for us but depending on the time of the year you’re going, you should pay attention to sunrise/sunset times and make sure you allocated enough time to make it to your evening destination before it gets too dark. Don’t overpack. Try to be as light as possible. I definitely overpacked and repacked twice before I left. Bring an extra battery pack in the event the refugio you’re staying out loses power or there are not enough electrical outlets to go around. Is Going to Patagonia/Torres del Paine worth it? If you love adventure, unpredictability, and nature, YES! And if you’re from an area where you don’t get to see beautiful mountain ranges or clear teal lakes as often, DOUBLE YES. As I mentioned in a prior post, I think people who are already from gorgeous natural environments or have constant access to them may not find it as appealing (especially if the weather is terrible). Beauty is subjective and in the eye of the beholder. I thought Torres del Paine was unique in its landscape, terrain, and colors. Being so remotely caught off from the world was also wonderful. I can’t remember the last time I had zero access to the news/internet/communication for 5 days (some WiFi access is available in the refugios but really expensive and may not always be working). It was great to be present and in the moment with the soul of the earth. What better way to end a 2+ week trip to South America than visiting the vineyards of Mendoza, Argentina??? As much as I was excited to go to Patagonia, I was also really looking forward to enjoying the gastronomical forces of Mendoza. From NYC? Super easy! Fly direct to Buenos Aires (EZE) and then book another flight to Mendoza from the domestic airport (AEP). The flight between Buenos Aires and Mendoza is about three hours or less. From Patagonia? Do a ton a of research! We really had to coordinate this carefully as there are not that many flights out of El Calafate. In addition, within Argentina, many flights require a stop in Buenos Aires before venturing onto another city, even if the city is not in the same direction as BA. Quite annoying but I think it’s just the way their infrastructure is. At the beginning of planning our trip for November back in June, I remember seeing a LATAM flight at around 4 pm on a Saturday leaving from El Calafate to BA, and then to Mendoza. A few days later, that flight completely disappeared!! And never returned (I checked again as our trip got closer). So we ended up booking with Aerolineas Argentina again, which was really great and on time throughout our trip. Since we knew we were going to be in El Chalten a few days, we needed to plan our trip to Mendoza carefully. We ended up booking a 2:15 pm Saturday flight out of El Calafate to Buenos Aires EZE, arriving at 5:10 pm. We then had to transfer to the AEP airport and then catch an 8:20 pm flight from AEP to Mendoza, getting in close to 11 pm. We had no other choice because there were NO flights that we could book from El Calafate to Mendoza (via BA) on Sunday, the next day. Initially we were going to try to do two full days (Thurs + Fri) in El Chalten, then leave super early in the morning to go to Perito Moreno glacier and then get dropped off at the airport by 12:30 pm. However, we ended up going to the glacier on Friday and then taking our time to get to the airport on Saturday. I’m glad we ended up doing this as we wanted to enjoy visiting the glacier and not feel rushed. In addition, getting from EZE to AEP was smoother this time around as there was no rush hour traffic when we left EZE at 5:30 pm. We made it to the airport just after 6, with time to grab dinner and check in. Valle de Uco - This area is about an hour away from the city with a ton of newer vineyards and I recommend staying out here to be closer to the Andes Mountains and hire a private driver! On our first night, we stayed at the Sheraton Hotel in Mendoza since we were there really just to sleep. After days of backpacking/roughing it a bit, it was nice to stay in a true hotel! The Sheraton is the tallest building in the city with a 360 degree view of the city from its restaurant. The rest of the time we stayed at Postales Valle de Uco, a small, intimate boutique hotel which helped us organize our taxi driver and vineyard visits. A very important thing to know when planning Mendoza is to do your research on which places you want to hit up! I didn’t know this until a few weeks before we left but most of the vineyards are either closed on Sunday or Monday, and we were there from Sunday to Wednesday! Luckily I was still able to organize a decent itinerary but it was a bit stressful trying to coordinate it all. You should also double check/request the tours are given in English, if you want to do a tour in addition to the tasting. I believe that Valle de Uco tends to be closed on Mondays while Lujan de Cuyo tends to be closed on Sundays. Not all vineyards are closed on these days, but most seem to be when I was checking. And just because something is stated on a website doesn’t mean it’s true, so always call or email yourself to ask (Bodega Andeluna and your Sunday sunset wine tastings, I’m looking at you). Valle de Uco is a newer wine region, having being discovered and built upon 15-20 years ago and many more continue to be built today. Most are foreign investors from Europe but they’re all different and each vineyard also has unique architecture/history to it. Almost all the views at all the vineyards were like this—so beautiful! This is from Alpasion. I had made a rsvp at Bodega Melipal but I got my dates mixed up! So didn’t get to go but that was a place I wanted to try as well. I made a back up rsvp for lunch at Bodega Norton in Lujan de Cuyo but we were so full from eating basically the same menu every day we ended up skipping this on Wednesday. This was our first vineyard that we visited and coincidentally the most we bought wine to take home from. The grounds here are beautiful, the food was fresh and delicious, and the wines were fantastically drinkable. I bought three different wines from here, and they also had some deals going on which we took advantage of (like if you buy 4 bottles you get another for free, so we split up the deal). I would say most of the vineyards we visited, we can’t buy the wine here in the USA which is why we made sure to buy our favorites. I was worried if I bought too much right away I wouldn’t have room in my luggage but the wines from this bodega were my favorite of the trip. Lunch with wine pairings came out to about 2325 pesos per person (I think one of us had a premium tasting which we shared). Although the food at Bodega Lagarde was good, the lunch at Bodega Andeluna was even better! The salad tasted like it fell from spring and the steak was perfectly cooked at medium rare. The restaurant and vineyard is also gorgeous, but I like the intimate feeling of Lagarde (the servers were generous with their pours!) as a best all-around. Andeluna is tops for their menu though, which also included a fresh fish and other items. Lunch with wine pairing was 1675 pesos per person. I didn’t get a picture of it but I loved the buildings at O.Fourniers. They look like spaceships set amongst the Andes Mountains. The restaurant we ate at here was also nice and worth visiting, sitting atop a man-made pond. Bodega Monteviejo is a grand winery, one of the most popular ones from the Clos de Siete group, which owns 6 vineyards around Valle de Uco. Bodega DiamAndes is also part of this group and though the vineyard was grand and fancy, I didn’t enjoy the wines as much. DiamAndes wines seemed heavier, more full-bodied which I’m not a fan of. Monteviejo had a few nice wines and I still regret not buying a inky Malbec we tried. Bodega La Azul is the only Argentinian/locally-run winery in Valle de Uco. The family has owned the land for years and it was started by a female. We sat in the shade as we listened to the history of this beautiful place. I read that the food here is also great but their reservations for lunch were full so we only got to do a tour. Very intimate and you can also buy jarred fruit/garlic (garlic is plentiful in this region). Bodega Dominio del Plata is also run by a woman and was a nice visit as well, though it’s not small by any means! It’s the total opposite and Susana Balbo is well-known internationally for her wines. If I had the money I would definitely stay here next time! This resort is gorgeous and looks like a Caribbean hotel that was plopped down in the middle of the Andes Mountains. We wanted to use the spa here but it’s reserved for guests only. However, you can come for dinner which I highly recommend! The chef is well celebrated and this was the best meal of our Mendoza trip. They don’t have their own wine as some hotels might so we ordered a bottle of Solo Contigo, which is another local wine and after trying it I wish we had known about this vineyard as I loved it and would have loved to take a bottle home! The menu here has a lot of steak options and I had the grilled wagyu-styled steak which was excellent. You haven’t had Malbec unless you have it in Argentina!!! Highly recommend a trip out to Mendoza, especially if you have a penchant for gastronomy and art. Our hotel hooked us up with a local driver who lives in the Valle de Uco region. He doesn’t have an online presence but was super reliable at affordable prices (if you’re in a group). He charged us about 3000 pesos a day if we visited 3 vineyards (they wait for you while you’re there) and 2000 pesos if we went out to a nearby dinner in the area. Almost every vineyard took us btwn 20-40 minutes to get tp (on avg. it was mostly 30 min). and we paid cash for all our taxi rides. He also charged us 3500 pesos to pick us up from the Sheraton to get to Valle de Uco and on the way back, it was 4500 pesos because we also went to a couple of vineyards and then to the airport. At the time of our visit the exchange rate was $1 USD = 35 pesos. He was reliable and we were never late to get to anywhere. If interested in using him please feel free to contact me at [girlfromny] at gmail and I’m happy to share his info! El Perito Moreno Glacier or Glacier Grey? Glacier Grey is enormous. There’s three front-facing sides to it and it’s a grand ice field. It’s wider in scale and scope compared to El Perito Moreno. El Perito Moreno is taller. While it’s also pretty large, it’s not as majestic as Glacier Grey but the height is noticeable. Glacier Grey you can see on a boat excursion, which is longer than Perito Moreno’s boat tour. If you do this boat tour, you do NOT need to do the one at Perito Moreno. The boat ride at Perito Moreno is pretty boring as it only goes back and forth one side of the glacier (whereas in Glacier Grey you visit all three sides). The platform viewing boardwalks at Perito Moreno is a GREAT way to experience the scope of the glacier and to be above the glacier itself. Hence, if you have time, visit both. Do the boat tour and glacier hike at Glacier Grey, and do the platform viewing boardwalks at Perito Moreno Glacier. If you only have time to do one, you’re not missing out too much on the other one. So, I can’t offer much advice in terms of public transportation as we took a private transfer service with our lodge, Aires del Fitz. The owner also runs his own car service operation so you can contact him for that separately. Initially we were going to do a side excursion to El Perito Moreno Glacier in the morning before we flew out to Mendoza in the afternoon but we were worried about not having enough time to enjoy the glaciers so we ended up going on our 2nd full day in El Chalten (since we didn’t do any more hikes). The roads from El Calafate and El Chalten are SMOOTH. I read before the trip that it was bumpy with lots of potholes but maybe that was a long time and they’re repaired? I didn’t find the travel to be difficult at all. In the private transfer, it took us 2 hours and 15 minutes between the two towns. From El Calafate, it’s about another 30-45 minutes to El Perito Moreno Glacier Park. Once you reach the first entrance though, the road and speed limit is bumpier and slower. The entrance fee as of Nov. 2018 was 600 pesos cash per person. The boat tour runs almost every hour and is another 600 pesos (which you can pay with credit card). The boat tour sells tickets in a booth close to the shuttle buses that take you to the top of the boardwalk platforms. We left El Chalten at 8:45 am and with one bathroom rest stop, we arrived at El Perito Moreno Glacier at 12:30 pm. We immediately booked tickets for the 1 pm boat tour, which is around the corner from the cafeteria on site. The boat tour was ok; we had just been on one a few days earlier at Glacier Grey so this ride seemed like a repeat for us. Totally skippable either way, unless you just really want to go on a boat tour! Since we rushed to get on the boat tour, we did the rest of the day wrong! The boat starts where the boardwalk ends, but we thought that’s where the boardwalk begins so walked UP on the platforms. The right/better way to do it is to take the free shuttle buses up to the top of boardwalk platforms and work your way all the way down. Since we realized this too late (we only had 4 hours here and one hour went to the boat tour, the 2nd hour went to eating lunch, so we only had two hours on the platform), we just kept going up the platforms. However, I loved how close you get to the glacier and the view when you get close to the top is beautiful! We did hear the ice calving a few times as well which was nice. We would hear calving every 10 minutes or so. We left at 4:30 pm and got back to El Chalten close to 8 pm (there was a bit more traffic thru El Calafate than in the morning). I do wish we had more time to navigate the platforms as we definitely did not experience all of it. I don’t think we missed that much but if we had 3 hours instead of 2, that would’ve been perfect. The Wall. Where art thou, Jon Snow? Everyone I spoke with prior to the trip said I HAD to visit El Chalten, Argentina too, which is about two hours northwest of El Calafate. Most people either start with El Chalten before going to Torres del Paine or vice versa. I’m glad we did Torres del Paine first! Quite a few people feel El Chalten is similar/more beautiful than Torres del Paine. I think it really depends on what weather you’re having as I think both are very similar to each other! Mt. Fitz Roy at El Chalten is the inspiration for the Patagonia logo, by the way, but to me, it looks very similar to the Blue Towers except the jagged mountain is on the left overlooking a beautiful lake while the Towers are on the right. Anyway at this point of our trip we were so exhausted from hiking that we did not attempt to hike to Mt. Fitz Roy. Instead we opted for the easier hike, going to Cerro Torre. However, let me backtrack first and discuss how we got from Puerto Natales to El Chalten. We took the same bus back from the way we came, hopping on with Cootra. I had a small mishap before we got on the bus though—we were in the taxi going from our hotel to the bus terminal in Puerto Natales (a very short ride) when I realized I forgot an important bag (it was my daypack with some personal effects) at the hotel! Thankfully I realized this before I got out of the cab and so the driver took me back but he definitely overcharged me for the ride (should’ve been like 2000 pesos but he asked for 5000! But honestly this is like a $3 difference, but still). Had I not realized it before we got out of the taxi, I may have been screwed as the bus terminal was really busy and there were no free taxis. Anyway, the bus left at 7:30 am on a Wednesday morning and it was nice to get the border crossing over with at the beginning of the ride. We arrived in El Calafate at 1:30 pm and waited for our private transfer to pick us up. I had booked us lodging at Aires del Fitz, which is family owned and has just 4 rooms. The guy who owns/operates it lives on the property and built out other units for rent. He also offers transfer services for reasonable prices so we just booked with him to pick us up from El Calafate to El Chalten. The roundtrip price for 4 of us $300 USD, so about $75 pp. I don’t think this was significantly more than the bus, but also the bus schedule is limited so this made sense for us to do. We found the roads to be quite paved (prior to going I heard there were a lot of potholes but maybe they fixed the roads?) and it took us about 2 hours and 15 minutes to get in between the two towns. El Chalten is tinier than El Calafate but has as similar vibe—laid back, lots of bars and restaurants. A couple of friends did laundry in town here as well (very cheap) and the weather here was incredibly fickle. About 15 minutes after the above picture was taken, it hailed for half an hour! The day after we got into El Chalten, we decided to do the Cerro Torre hike, which brings you to a lake, Laguna Torre. It is an 18 km hour round trip hike (you go back in the way you came, it’s not a loop) and there are markers along the way (first I’d seen anywhere during our hikes). The markets were extremely helpful. The hiking trail starts at the edge of the town (easy to find, follow the signs!). We had pretty good weather for this hike. We left at 9:30 am and I’m glad I brought my trekking poles on this trip as the first 2 km are steep to go up and then km 3 + 4 is a mixture of uphill and downhill. I also didn’t wear my knee brace for this hike and I really felt the difference—I’m really glad I had it for Torres del Paine as my knees were a bit sore from this hike. After km 4 though it’s pretty much flat to the end of the trail, which is pretty well marked and a lot of people along the way. There’s also a couple of bathrooms on this hike (ok, more like port-a-potties with the hole in the ground) but bring your own paper/cleansers! As we got closer to Laguna Torre, it got cloudier and windier. At times along the trail we could see the top of Mt. Fitz Roy (the highest points of the mountain to the right below) but not much. We at least got to taste the freshness of glacier water one more time on this trek. By the time we reached the end though it was really gusting and we took shelter behind some short wall fortresses to rest and have lunch. The clouds covered the money shot for us but it was still lovely. We spent a lot of time taking pictures here and left at 1:15 pm, getting back to town by 4:30 pm. Although for me it wasn’t as scenic as Torres del Paine (though it was pretty!) it was a much easier hike than any of the trails we did on the 5 day trek. This was the last hike we did on our trip and a nice way to close out. On our fourth day of the W Trek, our luck with beautiful weather ran out. While I woke up early in hopes of catching a glorious red sunrise, I was greeted by dark clouds, wind, and light rain. After the standard breakfast (where we also heard music for the first time in days in the cafeteria! ), we packed up to leave by 9:15 am. The hike to Refugio Grey was only 4 hours but after three days of trekking, we were all pretty worn out and 4 hours felt like 8! The wind didn’t help either—it was so windy that I never looked up the first hour of the walk. All I could do was focus on the pair of boots walking in front of me. I knew if I looked up my hood/cap that I wore underneath would likely fly away as well as the winds were quite forceful. This hike is pretty much uphill to the midway point and then descends on the other side. At this point it was pretty hard to stay motivated and every time I thought we climbed the hardest uphill, there was more to conquer. Unlike the previous days, the minutes ticked by slowly. There were tricky sections of the hike due to the steepness and the wetness. The coolest part of the trek was seeing Glacier Grey from afar. I didn’t allow myself to look at pictures before this trip and so I was surprised and delighted at the sheer enormity of it in person. The height and the width of this glacier was massive! The last hour of the hike was a struggle. I felt like Phoebe, from the TV show Friends, when she flails her arms in all different directions when she runs. I was definitely flailing my arms and trekking poles around to steady myself and climb down towards the next refugio. And as soon as I caught sight of a gray roof through the trees, I felt like one of those characters from Lord of the Rings, when they light up at seeing their destination in the distance. I think I practically ran to the lodge in those last 5 minutes of the trek. I felt exhilarated when I arrived as it meant I was finished completing the W Trek! Even though it was physically and at times mentally tough, I did enjoy and appreciate the experience. It was great to disconnect from the world and just focus on what’s going on right in front of you. We finished the trek at 1 pm but when we arrived, we found out that it may not be over and my heart sank. The W Trek can be done in 4 days (with the 5th day reserved for an optional kayaking tour or glacier hike before taking a boat out back to the south entrance of the park across the lake) but the weather forecast for the next day called for 90 km/hour wind (like 55 mph). If our boat ride out of the park from Refugio Grey got canceled, that meant we would have to hike back to Refugio Paine Grande and try to catch a boat from there. I really did not have the energy to re-do the four hour hike all over again, even though it’s the shortest leg of the trek! Or at least not with my backpack on as my shoulder had started to feel really sore. After resting at Refugio Grey for a bit, we took a short walk to see Glacier Grey more up close in person. The glacier overlook is about a 15 min, walk from the refugio. Afterwards the group split up a bit and I decided to go up to the suspension bridge overlooking the glacier. There are two suspension bridges and they’re supposed to be the most ‘exciting’ ones in the park. The first one is about 30-40 minutes away from Refugio Grey while the second one is another 30-45 min. away from the first bridge. The first bridge is soooo Indiana Jones! You have to climb up like you’re climbing a ladder to get on it and only 4 people at a time are allowed on it. Walking across the bridge is a bit thrilling as well as you’re dangling high over a stream. It was the highlight of the day for me with Glacier Grey serving as a perfect backdrop. I love how blue the glaciers are here. I’ve seen quite a few (in Alaska, New Zealand, and Iceland) and Patagonian glaciers are the bluest I’ve seen! They’re blue because they’re so compact. It wasn’t until about 11 am the next morning that we found out the 2 pm boat ride was cleared to go. Our group was thrilled! Although the day was mostly clear, the winds were a bit strong but not as crazy as forecasted. Yesterday on our hike to Refugio Grey we had seen a group hike back to Paine Grande as their morning boat was canceled. So I was really happy we didn’t have to do that! Everyone in the group had other travel plans right after the trek so missing a boat was not an option. Some people on our tour did kayaking while others did the glacier hike. As I’ve hiked on a glacier before in New Zealand, I had no interest in going again, especially since I was so tired and just wanted to relax. My friends that went loved it and enjoyed it though, and they shared that they had to a hike a mile to the glacier before putting on crampons to hike around the glacier. They acknowledged if they had to hike back to Refugio Paine Grande after the ice hike, there was no way they would’ve had the energy to do it (they left for the hike before 9 am and returned just around 1 pm so they didn’t know whether or not they had to hike back yet). The group that went on the kayaking tour ended up not kayaking at all—30 minutes after they attempted to kayak towards the glacier, the operators called it off and had them all head back to shore as the winds were so gusty and they didn’t think it was safe for them. However, they did take everyone out on a boat ride to the glacier instead as an alternative. They enjoyed it but this experience sounds similar to the boat tour they ended up taking with the rest of us at 2 pm! Since I opted out of these optional activities, I went for a relaxing stroll back to the overlook instead and just sat admiring the gorgeous glacier. At 1 pm we all headed down to the lake to catch our boat excursion. This boat leaves from the Southern entrance of Torres del Paine and is a sightseeing boat. Many people will take a day trip out to the glacier (and never doing the W Trek) so we were being picked up second as part of the excursion. The boat ride was really nice (they give out strong pisco sours!) and we sailed up pretty close to Glacier Grey, which has THREE not two front-facing sides. Our ticket out of the park! The boat tour was about an hour or so before we headed back to the southern entrance of the park. I was feeling a bit sad this leg of the trip was ending but as soon as we arrived on the other side of the lake, we were greeted by an unexpectedly arduous walk to the parking lot! Basically the winds here in this valley were probably the 90 km/hr (50 mph) winds we expected. And we had to walk across in sand with our backpacks. That 15 min. is seared in my mind as at one point if it wasn’t for my backpack I thought I’d be blown away and I almost lost my cap! Just a last reminder of how fierce the weather can be in this wild, wild place. We reached the lot at about 4 pm where our private transfer van was waiting for us to take us back to Puerto Natales. I watched the mountains disappear from view as our van took us back to civilization. Every ache, pain, moments of hangriness, and missed hours of sleep was well worth it though. Day 2 was my favorite day of the W Trek mainly because I woke up energized and ready to tackle the day. Part of this exuberance stemmed from these electrolytes that were laced with caffeine but who cares, I’ll take it! My muscles were sore and stretching them the night before and the morning of really helped. Breakfast at the refugio was nice but very basic (eggs, ham, cheese, cereal, bread and yogurt). We started our hike at 9:30 am and had to retrace some of the trail we took yesterday before it splits off to Los Cuernos vs. Mirador de Torres del Paine. After about a half hour, we reached ‘new trail’ and off we went. We had another brilliant day of warmer weather, sun, and no wind. The hike was not super easy but definitely easier compared to the day before. There were a couple of intense steep uphills for 20 minutes but overall this trail was a gradual ascent and descent throughout. After about an hour after we started, we came to this gorgeous view. I love how these two lakes are completely different tones of blue. We hiked alongside Lake Nordenskjold for most of the trail and it was a brilliant, clear aquamarine. I remember thinking how beautiful this part of the trail was and I couldn’t imagine seeing anything more beautiful. Pictures don’t really do the views justice, everything is magnified in person. Even the guides remarked how still the weather was. Generally due to the winds, you’d see ripples and waves on the lake, not a perfect reflection. In the two years one of our guides has been doing this trek, he said he’s only seen it like this a handful of times, when the weather was gorgeously calm. This is the main reason why I would never do the W Trek again. I can’t imagine my experience being better than what it was with the incredible weather we had. Although I braced myself for wind and rain, we luckily only experience one day of it. Our initial plan was to hike all the way to Domo Frances, which would’ve been another two hour hike after Los Cuernos and this section of the trail is steep. However, when we arrived at Refugio Los Cuernos for a break, our guides checked with the lodge and they had space to take us! Apparently a lot of tour companies may block off rooms but I guess there was a cancelation. The lodge allowed us to switch (although Domo Frances and Los Cuernos are operated by two different companies, I guess they work together somehow and allowed it to happen). I was relieved as Domo Frances has pretty crap reviews, even though it’s one of the newer ones. Thus we ended up finishing the day early before 4 pm and just hung out and relaxed around the lodge. You can even hear the avalanches from the French Valley here (I heard a couple in late afternoon!). This day was TOUGH and might have been even worst than the first day as it felt much longer than the 8 hours it took. We left at 8:30 am and finished at 4:30 pm. I woke up super early at 5:30 am as I wanted to see the sunrise hit the mountains and exude the sky with red. However I just missed the golden hour and only caught remnants of it (I should have skipped brushing my teeth and headed out then!). The other days were cloudy in the morning so there was no other chance. From Refugio Los Cuernos, we hiked a very pebbly path to the beach by the lake. At the end of this was the start of an uphill climb towards Domo Frances and Refugio Italiano. We got to use decent bathroom facilities near the campsite of Domo Frances (we never saw Domo Frances as you need to go down a different pathway) and then continued on to Italiano Campsite to start the roundtrip hike up to the French Valley to see glaciers and listen to avalanches. The hiking along this portion of the trail seemed rockier and it was definitely steep but not as steep as the very first day. Once in a while I would look up to see the views behind us but for the most part it was just go go go. We reached the Italiano Campsite (no refugio here, just tent camping) at about 10 am and dropped off our large hiking backpacks (everyone does this but don’t leave anything important just in case!) and switched to carrying just a daypack to the French Valley. It took about two hours to get up to the overlook and we had our lunch up there while admiring the view and listening to the crumble of avalanches. This picture below doesn’t capture all of it—it’s much wider and grander in scope. We stayed up here for about 45 minutes before heading back down to pick up our bags and continuing on to Refugio Paine Grande. After getting back to the Italiano Campsite, we headed westwards towards Paine Grande and it started to get really hot and sunny. It didn’t help that there was zero shade. In Dec. 2011 an Israeli backpacker set this forest on fire by accident and it burned for two months, destroying wildlife and a lot of this area of the park. He has since been banned from the country but the damage is brutal. Due to the damages, there are quite a few boardwalks around here instead of trails. By this point I was really tired and had to start singing songs to myself to get through the hike and make the time go by quicker. In total it took us about 2.5 hours to get from Italiano to Paine Grande but it felt way longer than that. During the last 40 minutes, the bottoms of my feet began to feel like they were burning, which I’ve never felt before when hiking. This view below of Los Cuernos though was the highlight of my day. I’ve seen a bunch of glaciers already (New Zealand, Alaska, Iceland) and so to me, the terrain of mountains, lakes and valleys are more appealing to me. I remember sitting here and staring at this and it looked so unreal even though it was right in front of me. As we moved closer to Paine Grande, the wind REALLY picked up and apparently this area of the park is the windiest. We were so hot and sweaty though that the gusty winds helped invigorate us to get to the end. I remember feeling a small ounce of joy once the refugio came into view from afar. As I mentioned in my Refugio post, this was my favorite place to stay because I loved the scenery around it. It was a great relief to kick off our shoes and enjoy the warm windy evening outside by the lake and watch the sunset. Skipping stones and chatting with everyone else from our tour group here was my favorite evening of the trip. 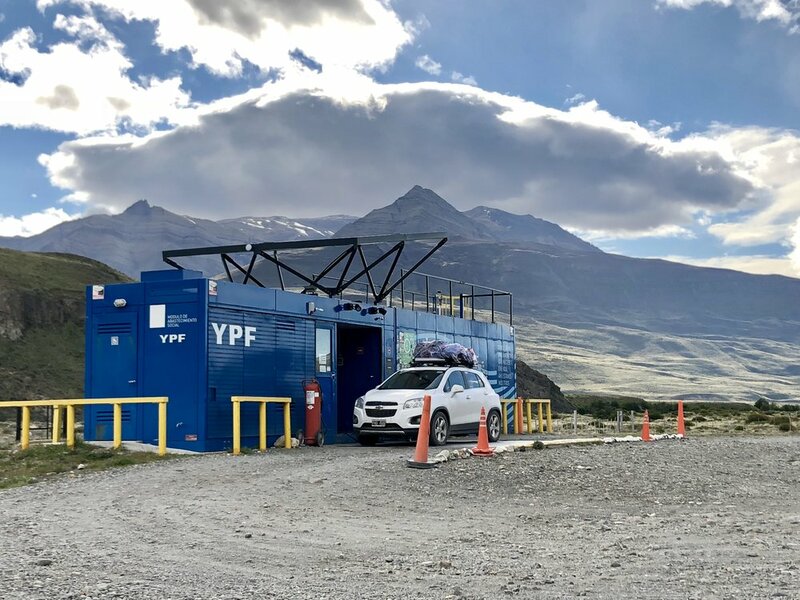 On Friday, Nov. 9, we were picked up by our private transfer van at 6:30 am and driven up to Refugio Torres Central, which is by the northern entrance of Torres del Paine National Park. We arrived within two hours and saw some ucos (llamas) along the way, grazing the grass before the park entrance. After dropping off our backpacks for storage and only carrying our daypacks and trekking poles, we started off for the long hike at 9:05 am. The weather forecast predicted by Mountain Forecast was pretty reliable. I checked the forecast every day until we arrived in Puerto Natales and it called for a calm, sunny weekend with temperatures ranging from the 40s to high 50s. To have NO wind is pretty incredible as this area is know for its forceful winds. In fact, when we stopped to take pictures of the valley early on during the hike below, our guides mentioned it’s usually too windy to stop here for pictures. Our hike started off flat before ascending up through a gravelly trail. The halfway point of the one way route to the towers was at Refugio Chileno and we stopped there after a couple of hours of trekking for a snack and to fill our water bottles. After passing through some valleys and the refugio, we came upon the forest, which was the easiest hike of the trail and a much needed ‘break’ as this part was mostly flat. Along the way we crossed a few suspension bridges and filled our water bottles at the glacier streams. I was really hesitant to consider drinking from the streams but honestly it was the best water I’ve ever had in my life! No one got sick from drinking the water straight. The water is so clear. I initially bought sanitization tablets but didn’t end up bringing them anyway. I really miss drinking this water. My water bottle did have a carbon filter on it but that’s about it. There aren’t really any animals in the wild here except for pumas (which we never saw) and hares and smaller wildlife. We reached the base of the towers at noon and from there, it was about an hour hike through a rocky path to the top. This was the hardest trail of the trip, especially after you’re already walking for hours! My trekking poles really helped me get up there. It was exhausting but not impossible to get up there. I hadn’t really eaten much of a breakfast which was a poor decision on my part as well. You will be burning tons of calories on this hike! I got an Apple Watch for this trip and based on my height (I’m 5’2”) and weight (not telling!) I burned about 2000 active calories on this hike and over 1500 resting calories. So not eating much in the morning really hurt me since I was so tired from lack of food. The views up here were picture perfect though and the first thing I did when I got up here was whip out our packed lunch and eat everything! The trail was busy but not overwhelmingly crowded. Although to our guides, they found it to be too busy but I’m a New Yorker and didn’t find it to be that bothersome. I would say about 75-100 other people were up here when we there. Everyone was spread out so getting pictures without people in it wasn’t a challenge. The sky cleared up and no wind made it even more magical as that’s the only way you’ll also see reflections in the water (as seen above at the top!). We stayed up here for about an hour before heading back down. Going back down was tough as your limbs are already tired and everyone is heading down around the same time too. However, I didn’t think it was that bad in terms of a crowd (compared to how it is at the popular upstate NY hikes!). Obviously starting earliest in the day is better to beat the rush. In addition, if you don’t get to the base of the towers by 4 pm, they won’t allow you to continue up for safety reasons (the sun goes down in November after 8:30 pm). We left round 2 pm and passed through the same way we came, with a brief stop at Refugio Chileno again. All trash you bring into the park you’re expected to carry out (or throw it away in the bathrooms at the refugios!). We finished the hike at 5:45 pm. I remember as we headed back down that I must have blacked out during parts of the ascension up as I did not remember some of the areas we passed through! It was the longest hike I’ve done so far in one day. While I love the outdoors, I’m a city girl at heart and although I worked out and ‘prepared’ for this trip all year long, I still found it difficult (but not impossible). The views of the turquoise lakes all around were beautiful and after we got back to the refugio, we did a LOT of stretching for our tired muscles. Overall it was a beautiful day and a beautiful hike. My friends will find it impossible to believe but I think this was my favorite HIKE of the trip (but not my favorite day since I was hangry half the time, but that was totally my fault!). El Calafate is a cute town and it seems to be thriving! It reminded me of the quaint shopping areas of Sedona, Arizona and other popular hike/ski resort towns. According to the locals we spoke with a lot of the restaurants and shops are on the newer side of things as tourism has increased. 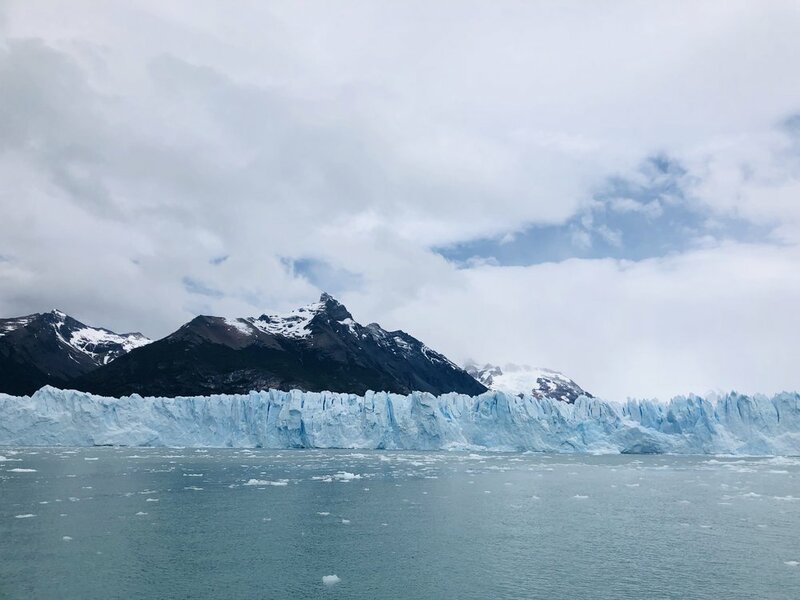 It’s not too big and spending a couple of days here would keep you busy, especially if you’re off to see the Perito Moreno Glacier (more on that in a different post!). I really liked El Calafate and we had a great first Argentinian meal at La Zaina, one of the more popular restaurants in town. We didn’t have a reservation (would probably recommend it) and walked in around 6:30 pm and got seated in the back. The highlights here were the steak and the lamb braised in Malbec sauce. I am not a huge fan of lamb (I find it to be too gamey for me) but the lamb here didn’t have that texture/aroma that usually puts me off. We only spent one night in El Calafate and stocked up on some snacks to bring with us to our bus ride to Puerto Natales the next morning. As I mentioned in a prior post, we took Cootra down to Puerto Natales and the ride was smooth and easy. 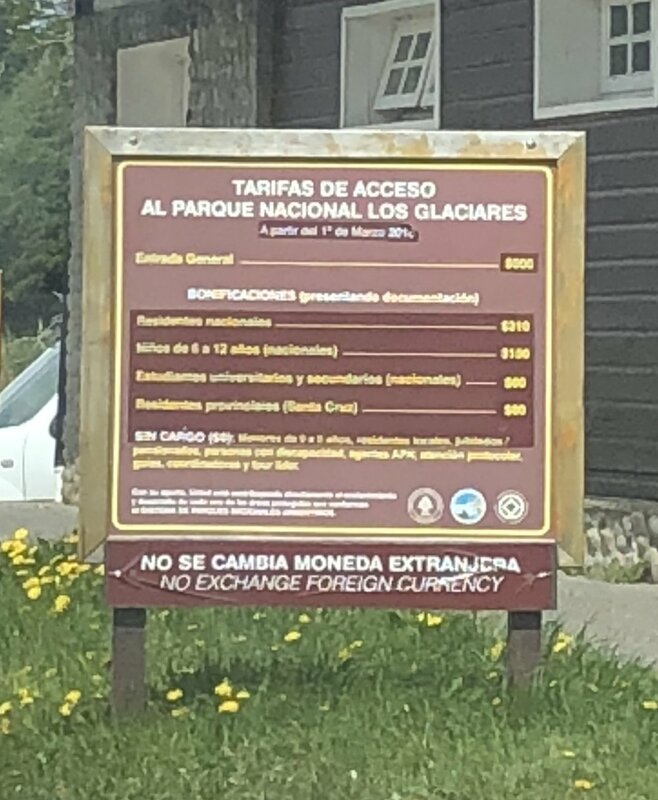 We left at 7:30 am from El Calafate, got to the border around noon, and the entire security check on both sides and border crossing took about an hour. There are clean bathrooms on the Chilean side of the security check, none on the Argentinian side. And the Chilean side is the only side where they scan everyone’s luggage (yep, gotta take all your bags with you off the bus). From there, the bus ride to Puerto Natales was another 45 min. or so. Ironically, if you look at the map, if they created new roads the drive from El Calafate to Puerto Natales could be much shorter! And if they created more roads near the border of Torres del Paine, Chile and Argentina, you would never have to pass through Puerto Natales, which is more further south. But, this probably won’t happen for years, if it happens at all. It’s probably for the best though as I don’t think the park could handle the influx of large tourists. Puerto Natales is much smaller than El Calafate, and though it’s not as built up yet, I was impressed but some of the new buildings and designs flickering around town. We had two great meals when we arrived in Puerto Natales, one at Kawesqar Cafe and the other at Santolla (which means king crab). Since we got into town around 2 pm, we had a late lunch and got the meat platter which was freshly grilled for us at Kawesqar and included everything from chicken, steak, blood sausages to potatoes. After our protein-rich meal, we walked around town and then went to our briefing at the offices of Chile Nativo to meet our trekking guides and the rest of our group. Yes, Chile Nativo does exist! It’s always a bit apprehensive to book with a tour operator you can’t find much information on but they were really great to organize with and I can’t recommend them enough. Afterwards we walked down to the lake to check out views of Torres del Paine from afar. Excitement ran through my veins as I thought about what the next few days in this park would bring. Our hotel for our first and last night in Puerto Natales was at Hotel Vendaval. The staff here is so friendly and leaving our luggage here while we were in the park was safe. Love the shipping container structure. There’s also a rooftop bar which was great to hang out in at night. You must try Chilean wine! It’s called Carménère. I didn’t discover it until our last day in Chile when the bartender at the hotel served it to me and now I’m sad I could’ve been asking for it every night while we were in the park too. It wasn’t as common in Argentina. It’s a nice red wine, different and seemed lighter than Malbec. Our ‘light’ dinner at at Santolla, which is known for all the king crab dishes. So cozy and modern inside. The highlights were the seafood stew and the crab meat (there are different variations you can get). Too bad we were so full from lunch as I wish we got to try more dishes. One last thing about Puerto Natales/Chile in general—where has merken been all my life??? It’s a special spice only produced in Chile. It’s like paprika, but smokier and a bit spicier. If you like spices, pick up some merken in Chile before you leave! We found a few locally made ones in the Puerto Natales supermarket as well as a commercially produced one at the international duty free shop at Terminal C in EZE for $5 USD. I don’t think it’s carry in the U.S. at all and would make for a great souvenir. I had very low expectations in terms of the quality of food in El Calafate and Puerto Natales but everything we tried in the restaurants we checked out was so good. Wish we had a little bit more time to explore but I think the amount of time we had was sufficient for both. We ended up doing the Perito Moreno Glacier tour from El Chalten (since we were heading there) but recommend people stay two days if you want to check that out. We saw the glacier after our 5 day trek and both were incredible to see but for different reasons which I’ll discuss later! Planning for Patagonia is not logistically easy. It basically took me and my friends three days to get to Torres del Paine (pronounced Torres del “Pine-ay”), which resides in Chile, from NYC. Most people fly into Santiago, Chile to travel to Torres del Paine but we chose to go through Buenos Aires, Argentina as we wanted to end our trip visiting the vineyards of Mendoza. This is the fourth time I attempted to plan this trip and I’m glad I waited this long. The first time I looked into going was more than 10 years ago and information on Torres del Paine is not as plentiful as it is today. The internet/communication infrastructure has probably improved over this period of time as well and a lot of things in place years ago are no longer. Four years ago I went to Argentina to visit Iguazu Falls (amazing, highly recommend waterfall lovers to go) and had to pay a $100 or so reciprocity fee (valid for 10 years) to get into the country. Well, apparently as of last year that’s no longer in place. In addition, the last time I was in Argentina, I had to exchange all my money on the ‘black market’ because the exchange rate was fixed as $1 USD = 8 pesos (on the black market you could get up to 12 or 14 pesos) and today, $1 USD = 35-38 pesos! Anyway, planning a trip to Torres del Paine is no easy feat unless you have a lot of time on your hands. You need to register with the park and also make reservations in advance if you want to stay at the limited number of refugios (hostel lodges) in the park. From what I read on the internet, booking a bed or tent at the refugios was frustrating (payment won’t go through, people don’t respond, sold out, etc.) so early on my friends and I decided to bite the bullet and sign up with a tour guide instead to do all the bookings for us. After a bunch of research, we decided to go with Swoop Patagonia. They have a flashy website and were very responsive and their itinerary worked out for us. However, as soon as we said yes to booking, they turned us over to Chile Nativo! So it turns out Swoop Patagonia is a 3rd party seller of tours and Chile Native is the local operator who actually takes you on the tour. It worked out anyway though as we LOVED Chile Nativo (and after speaking with them, I can see why they need Swoop—the agency has been around for over 15 years but is a small-run tour operator which has grown bigger in the last year and they just haven’t done as much marketing as they can be doing). We found the price to be reasonable for our budget (we did the 5-day trek for $1695) though yes, if you planned this on your own, you’d be saving more than half. We just didn’t have the time to plan it all ourselves so to us, it was worth it. And no one in our group is an experienced camper or hiker so we felt more comfortable going with a guide in case something happened or someone got sick/injured but you don’t really need one. The trails on the W Trek are all well marked paths. This is literally what you can expect from hiking Torres del Paine. Our trip started at Refugio Las Torres and we stayed overnight in Los Cuernos, Paine Grande, and Grey. The first day of the hike to the Base of the Towers was the hardest (22 km roundtrip back to Refugio Las Torres) and took 8 hours. In addition to planning all our accommodations, meals, and guides in Torres del Paine, Chile Nativo also booked our first and last night in Puerto Natales (the gateway into the park). We stayed at Hotel Vendaval, which was a wonderful stay, and you’re able to leave whatever luggage you’re NOT taking into the park here (which we found to be safe and we had locks on our luggage as well). On Tuesday, Nov. 6, we took a 3:30 pm direct flight from JFK to EZE, the international airport in Buenos Aires, Argentina. The trip may have started off on the wrong foot had I not watched out for my luggage! I ended up bringing just two pieces—a carry-on size hiking backpack for the trek and a carry-on size suitcase that I checked in. Well, while the Aerolineas Argentina agent gave me my plane ticket at check in, I noticed he totally forgot about my checked-in bag! When I asked him about it, his eyes got wide and said “Oh, yes! Sorry about that!” and ticketed my luggage, stuck the slips on, and put it on the conveyor belt. Had I not watched/said anything, who knows if my luggage would’ve made it out! Probably not, since he didn’t even issue a luggage ticket until I asked! My other friend also had an issue with her luggage and bringing on her trekking poles. Mine were foldable and hidden but hers were bigger and sticking out and had metal tips and they had to recall her luggage (after she checked it in) to put the metal tips away. They wouldn’t let her pass security otherwise. Anyway, after the luggage issues, we otherwise had a smooth overnight flight and arrived in EZE by 4 am, and in November, Buenos Aires is two hours ahead of NYC. By the time we got our luggage and through customs, it was 6 am. I was paranoid about getting money from the ATM (last time I was in Argentina my cards didn’t work at all!) so I exchanged U.S. dollars at Banco Nacional, a local Argentinian bank. The bank is located directly outside the luggage, to the right. ATMs may have a limit to how much you can withdraw every day so I withdrew $600 USD which was more than enough to get me through the two week trip (most places except taxi cabs take credit card). The exchange rate I got it for was AR 34.60 vs. the official rate at the time of 35-36 pesos so not much of a difference. And if you do use the ATM, you will probably pay additional fees there too. We booked a car transfer with Taxi Ezeiza. I made the rsvp a few days beforehand online and they charged $35 USD for 4 people. They’re also located right outside the luggage terminal, at a big booth and if you make a rsvp your name will be on a sign at the desk. You can pay in dollars or pesos (or in credit card). We had rush hour traffic and it took just over an hour to get to AEP, which is the domestic airport in Buenos Aires. From AEP, we took a 12:15 pm flight from Buenos Aires to El Calafate, Argentina. You can either fly to El Calafate to get to Puerto Natales (the last town before Torres del Paine) or to Punta Arenas, Chile (which is further south than Puerto Natales). Two of my friends told me there was NOTHING to see in Punta Arenas whereas in El Calafate you at least have the Perito Moreno Glacier so I’m glad we stuck to El Calafate. Also, if you plan to visit more of Argentina after Torres del Paine, it’s cheaper to fly within Argentina than to fly to Chile and then back to Argentina. We arrived in El Calafate by 3:30 pm and grabbed a taxi to pick up our bus tickets for the next day’s trip to Puerto Natales. The bus terminal is about 15 min. away from the airport and costs like $10 USD to get there by taxi. We had to pick up our tickets the day before because they needed to verify our passport info for the border crossing. The bus office (Cootra) closes at 4:30 pm so keep this in mind if you choose to use them and fly into El Calafate before then! We stayed overnight at Hostal Gnomos, which is a 5 min. walk from the bus station. The next day: woke up early to catch the 7:30 am bus to Puerto Natales. We got to the bus station by 7 am though as we heard horror stories of buses leaving without people if they were not on time. The Cootra bus was quite nice and comfortable. It’s a double decker bus (you can reserve seats in advance) and there is a bathroom on board for the 5-6 hour drive. The driver didn’t really speak English though but we figured things out. By the time we got to the border crossing it was about noon and the whole process took an hour. On the Argentina side, they just stamp your passport. On the Chile side, they stamp your passport but they also scan your luggage (we had no problem bringing in snacks or food—I think someone got fruit in—but from what I heard it really depends on the mood of the officers!). The Chile passport security check has bathrooms which was much needed after the long drive. The Argentina side does not, and going on the bus is not really fun. So after security check it was another 45 minutes to Puerto Natales. When we arrived, we grabbed a taxi for 2000 Chilean pesos to Hotel Vendaval (like $5 USD). I had gotten Chilean pesos before the trip at Chase Bank (they didn’t offer Argentian pesos though and all I took was $60 USD equivalent in Chilean pesos which was more than enough. I never needed Chilean pesos on the W trek, just for the taxis. We ended up using the money for dinners in town though but they take credit cards). Checked into Hotel Vendaval. In the evening, we had our briefing at the office of Chile Nativo (literally a 2 min. walk from the hotel) and met our two tour guides, the rest of our tour group (10 people in total!) and got the details of the trip. The next day: got picked up at 6:30 am on Friday morning, November 9, 2018 for the hiking trip of a lifetime!!! This website someone recommended on Trip Advisor was amazingly helpful to check out the weather forecast in Torres del Paine: www.mountain-forecast.com. Just be sure to pick the lowest altitude and convert it to Fahrenheit if needed. I checked the forecast every day for a week before arrival and it was 90% spot on in predicting the weather we would be having in an unpredictable place. REI. I love this store. I know I’m late to the game but I grew up as a city slicker. I never grew up camping or being in the outdoors! But REI and the people who work there were wonderful resources for me in terms of what gear I needed for this trip. I got my backpack, trekking poles, jackets, windproof pants, blister bandaids, everything here. I’ll do a post later on the gear I got.